Grave Mercy by Robin LaFevers. Houghton Mifflin, 2012. Currently Available. Face Value: Though this book has some signifiers that I usually don’t like, with a girl in a fancy dress looking off into the distance, I’ll give the book some serious credit for the fact that this fancy dress is actually a fancy dress that said girl wears during the book. And some more credit for the crossbow. And some more credit for the awesome tagline: “Why be the sheep when you can be the wolf?” Basically you know this book is going to be Slatebreaking as soon as you look at it, and who can really complain about that? Does it Break the Slate? It’s about a 15th century convent that secretly trains assassins. So, yes, obviously. 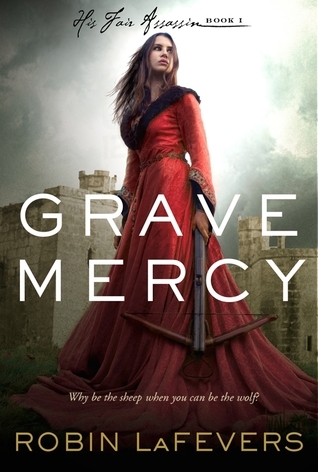 But also, even within the fantasy context, Grave Mercy is a complicated look at what life and options were like for a woman in the 1400s, and the characters in it go on their own, fascinating emotional journeys. Who would we give it to? This would be a natural recommendation for readers who loved Graceling or die hard Buffy fans. It’s long, and has a lot of historical detail alongside the main plot, but will definitely appeal to a certain type of fantasy reader. And essentially, here we have the crux of Grave Mercy. It takes place in the 15th century, at a time in history when women were not granted many rights and had few options or resources. So to envision an alternate world, in which young women are incredibly powerful, and have this venue for it, that doesn’t totally go against the reality of the time period – that’s very exciting to read about. It’s the recognition of historical limitations and creating a space through which those limitations can be defied that really makes the feminism in this book work. Grave Mercy begins in 1485, when Ismae Rienne escapes from her violent, loveless father’s house to a violent, loveless arranged marriage. But with the scars down her back and the belief that she was “sired by the god of death himself,” not to mention her status as a young woman, Ismae has few options. But soon, Ismae escapes her marriage and is brought to the convent of St. Mortain. Here, young women in similar situations are trained to be assassins and handmaidens to Death. As a final test from the convent, she is sent on an assignment to pose as the mistress of enigmatic Gavriel Duval and root out the truth about plots against the Duchess. A mix of political intrigue, action, history and romance, there’s a lot going on in this book, and despite its length, it moves fast. Robin LaFevers does a great job of embedding this alternate reality in historical detail, and the effect is an all encompassing world that is incredibly compelling. This is almost entirely a great thing, as I felt completely immersed in this reality while I was reading, though there were moments where I lost track of Ismae’s perspective in all that was going on. Though Ismae largely rejects traditionally feminine roles, and is far more interested in poison and weapons, she often finds herself using traditional expectations of women to her advantage. Playing on the assumptions people make about women as powerless, she gains access to essential information and is given an outlet for her attacks. She is not a powerful force despite being a woman – it actually strengthens her abilities. This is a more powerful Slatebreaking realization, even than Ismae’s realization of her own strength. Her recognition that the system has devalued all women, and that there is a bigger force of oppression out there is incredibly dynamic. And there are other stories out there. Sybella and Annith, other young members of the convent have their own adventures hinted at, and the “coming soon” pages at the end of this book confirm it – there are more stories to be told in this world. And I can’t wait to read them. This entry was posted in Reviews, Young Adult and tagged Assassins, Fantasy, Feminism, Historical Fiction, Religion. Bookmark the permalink. Loved this book, can’t wait to see Sybella’s story–recommending to all my friends! Yay! So glad that you liked it. Also, not surprised. It’s totally an Aimee book.